Women is not only a home-maker but also a change maker this title completely suits Ashamani Sahoo’s nature of living. Subsiding in the rural belt of Balabhadrapur village, Balianta Block, Khordha district, Odisha, having population of 353 where SC covers 60% of the total population. 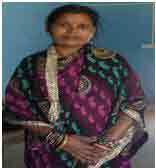 Ashamani like other typical Odia Bohu her priority is to serve her family members. Her household activities begins before sunrise and ends at midnight. Like brooming of courtyard, washing of utensils, clothes, taking bath, flucking of flowers, doing pujas, cooking food for elders and young ones, cleaning of cow sheds, paintings of walls with cow-dungs, making cow-pancakes, and many more like that. Life was moving like a machine. Once a misfortune happened with her husband, he had a massive heart attack, due to which he left his job, in this situation Ashamani did not panic and cooly controlled the situation. She not only managed the household work but paramountly tried hard to cure her husband. The only means of their livelihood was a small grocery shop, which she used as a good resource and developed it into a bigger shop, with multiple items, this shop not only provided them with bread but also gave them a ray of light to surplus their economy. Time taught her how to manage time, out of her busy schedule Ashamani work for the development of her people, for this reason people loved her a lot.Though she had willingness to do something for the people but lack of political power and money created an obstruction in the path of her imaginary thoughts. Many people forced her to join politics but the constraint from her family members pulled her back. Ashamani did lot of effort to convince her family members at the end in the year 2012 she contested the election for the ward-member position, won the battle by defeating her opposition Banambar Sahoo by 80 votes. The relishness for being a ward-member created lot of pressure because she had no idea what to do? How to do? What are her roles and responsibilities, with all these heavy questions she was lucky enough to meet the organisation called PECUC which is working for elected women representative with support from The Hunger Project .PECUC was in search of such represenatives who really wanted to devote maximum of their life for the well-being of the people, coincidentally both came into the same platform called the ALIBHA EWR’s Federation, there she explored the treasures of her learning, skills and experiences related to diferent issues and challenges faced at Panchayat level. From that day onwards she never looked back and one after another grab all the prospects of achieving in life. In a short span of time 3 years she compact with multiple development works like enrolling more than 40 nos.of people in various poverty alleviation schemes, Other instrumental work are construction of roads to SC sahis for that 1.5 lakhs was sanctioned and two other roads for that 2.5 lakhs & 1 lakh respectively, renovation of ponds, water-facilities to Schedule Caste households, electricity to the BPL card holders, a connectivity to cremation ground by constructing foot-bridge from MLA fund i.e. Rs. 8 lakhs. Being a President in Gaon Kalyan Samiti she utilised the fund Rs 13,000 for construction of a pit around the tube-well in-order to drain-out the stagnant water. Recognition from people brought a drastic change in her life-style. Her will power, hard-work has transformed her and her family life. The numbers go on and on but Ashamani never get exhausted of these works. She loves to be part of different activities organised by PECUC like Campaigns, rallies, street play and many more, whatever she learns from these activities utilise in a right way. She took keen interest in promoting kitchen garden, organising meetings, attending VHND programmes and many more like that. She says, “Helping others is my passion and this passion came from the encouragement of PECUC organisation & ALIBHA EWR’s. The biggest social issues are to banning the liquor shop in the panchayat that create lot of bad effects in the community , children, youth, family as a whole village and panchayat. The women are mostly victims in the community. She took an initiative to mobilise women and other stake holders in the community and united them to fight for banning the liquor shop. She knew that it is not going to be easy because this battle will be carried out in each home. But the fact that the Panchayats will have a minimum number of women we will use that strength for mobilizing women at large and keep liquor out, as a priority. Lastly she mobilised maximum numbers of women and with the support of ALIBHA Federation, she was successful in demolishing the liquor shop which was tarnishing the villages for so many years. With lots of hardship she gave justice to Rabi Sahoo family who was been murdered by some notorious and drunker near that liquor shop. Rabi’s wife got Rs.20, 000 as compensation, widow pension and a job as a helper in Anganwadi centre. She says Women are also aware that their strength comes not only from their numbers but also from their knowledge and skills, the training as an important part of their empowerment.